What are the best open carry holsters on the market? Despite what opponents would have you believe, people who carry guns visibly in public aren’t looking for trouble; they’re just being prepared. Before you can carry, you need to buy one of the best open carry holsters recommended by Gun Goals. Even if open carry is a right, should you? There are actually many valid reasons for open carrying. By thinking about your reasons clearly, you can share that information with others and maybe change some minds about guns. Here are a few of the most common reasons to open carry. One of America’s main strategies for National Security is called deterrence. This means that other nations or groups wanting to harm us are less likely to because they see that we have a strong military and are able and willing to defend ourselves. It’s the same idea when you open carry. Any potential criminal is likely to check out the environment before committing their crime. When they see someone or multiple people carrying guns in the open, the criminal is less likely to attack or rob the place you’re in. Criminals look for places that are weak in security. They look for stores and locations where they feel confident they can commit their mugging or robbery quickly and without repercussion. If you don’t trust logic, look at the facts. It’s statistically proven that increasing the number and visibility of police officers lowers crime rates by at least 10%. This proves that deterrence works! There’s a reason that companies sell t-shirts with popular shows and movie content printed on them. People love going out into public letting everyone know exactly how much they love NCIS by wearing it right on their sleeves. If you’ve ever done something like this and then seen a fellow fan, you know about that instant connection you feel when you find a kindred spirit. When you open carry, a similar situation happens. You’re proudly showing the public about your interests—in this case, firearms. And if you’re ever out and you find another person with a handgun on their hip, you can make that instant connection and possibly find a new buddy. The world is getting crazier every day. In some places, people don’t feel safe walking down the street or going to a public event like a marathon or concert. By open carrying, people may begin to feel safer knowing that someone is there who can step up in a dangerous situation. If you do decide to become a visible protector, take care that you are trained in firearm safety and have logged many hours of practice. You don’t want to become a liability in an emergency situation. Take your responsibility seriously; people may be counting on you. One of the main benefits of open carry versus concealed carry is the faster access you get from the open carry holster. In a dangerous situation, you may only have seconds to act, and going through the effort of reaching under your shirt to draw your gun can be scary. In this side by side video, the gun user times his draw speed to first shot using three different holster and positions. The open carry holster (not concealed) is almost a half of a second faster than the other options. Half of a second may not seem like a lot, but which makes you feel safer? With your holster on the outside of your belt, it shouldn’t get in the way as you go throughout your day. Nothing is tucked up against your body to poke it as you walk around. The only thing that you may notice is the extra weight on your hip. Open carry holsters usually have better retention than a concealed carry or IWB holster. This only adds to your comfort because you’re not constantly worried about your gun slipping out if you bend over or stretch. Well, now you’ve decided that you want to open carry, but are you allowed to? It depends on your state and laws. 30 states currently allow open carry without a license, 15 allow open carry with a permit, and 5 don’t allow it at all. Check with your state laws to make sure what’s legal and isn’t. Contact your Sheriff station or State Police to double check what’s allowed and not allowed for open carry in your area. When looking into buying open carry holsters, it’s not a hard decision to make if you’re prepared. Look at these factors and decide which is most important to you. Then, read the reviews of our top choices and compare them with the factors you found most important. Draw Speed – The top priority of open carriers is self-defense. If you’re in an emergency, you want a holster that doesn’t get in your way when you draw your gun. Retention – Holsters come with different levels of retention. They go from Level 1 retention—where the gun is held in place by friction—to Level 4 retention systems which use three mechanisms to hold the gun in place. While you probably don’t need three tools to hold your gun in place, if you’re afraid of your gun getting grabbed you may want at least one mechanism. Durability – Depending on the material and make, your open carry holster may not stand up to repeated usage. Each gun holster on our list is excellent in this category, but you always want to compare if this is a concern for you. The four main materials are leather, synthetic, hybrid, and nylon. Leather is durable and looks great, but takes some wearing in and maintenance. Synthetic is tough and maintenance free. Hybrid goes for the best of both world. Nylon is no good. Don’t get it. Cost – Naturally, not all holsters cost the same. If you don’t have the money for a certain type of holster, you can still find one to fit your needs by focusing on the other factors that are your highest priority. Style – Let’s be honest. If you’re wearing a holster out where others can see, there’s going to be a part of you that wants it to look good. Whether you want a classic leather or a sharp tactical look, don’t feel guilty for considering the style of the holster when other elements are equal. A holster is the second most important item when it comes to open carry (the number one being your handgun itself). But there are many popular options for accessories that can help you with the setup of your dreams. While you don’t necessarily need any of these products, it might be a good idea to check them depending on your reasons for open carry. Read below for the breakdown of each holster. Any of the 5 open carry holsters would be an excellent choice, but look at the features of each one and decide for yourself. Keep these ideas in mind as you read ahead and make a choice you’re happy with. The UTG Deluxe Commando Belt Holster is built to withstand the test of time with high-quality and tough synthetic material. The Commando holster is designed to fit medium-sized pistols with good retention with the easy-to-use quick release buckle. The durable holster is adjustable to fit your belt and preferred holding style with the hook and loop lock belt strap and belt keeper. The holster weighs in at a light 0.3 pounds and is the most affordable of our top 5 holsters. While the holster is nothing special to look at, it’s designed at law-enforcement grade and for tactical usage. Customers who enjoyed the UTG holster praised it for its fit to your belt and medium to small sized gun. Many also said the quality of the holster was far above what they paid for making this a great deal. The two main complaints centered around the size and retention buckle. Some users critiqued the size, saying that full-size pistols and even larger medium-size pistols may not fit easily. Several others complained that the buckle strap would sometimes get caught on their gun as they drew it. One user wore this holster while taking a shooting class and had to draw and reholster the gun many times. He said that he tucked the strap out of the way because of how often it got caught. FITS OVER 80 GUNS INCLUDING: M&P SHIELD, GLOCK 17, 19, 26, SPRINGFIELD XDS/XDM. Plus many more similar sized guns! OPEN CARRY OR CONCEAL WITH MAXIMUM COMFORT! Pre-curved to fit close to body while still providing easy access. 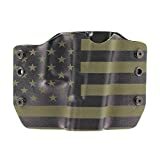 THE BEST LEATHER GUN HOLSTER ON AMAZON! 100% Satisfaction Guarantee. If you want the best, buy The Ultimate. The Ultimate 3 Slot OWB Leather Gun Belt Holster is appropriately named. This holster hits a lot of the different features and lives up to its “Ultimate” name. Though it’s one of the most expensive on our list, you get a lot for your money. The holster is made in the USA with high-quality leather. The 3 Slot allows you some adjustability in the cant which also gives you options in how you wear it on your hip. The holster looks great and very tough. With a pancake style design, the gun is very low-profile and still fits over 80 types of pistols. The holster can be worn with both open and concealed carry. The Level 1 retention means that friction and the fit is the only thing keeping the pistol in. This means quicker draws but also the possibility of the gun being grabbed easier. Relentless Tactical is so confident in the holster they offer a 100% satisfaction guarantee on this product. Users rave about this product and how well their pistols fit into the holster. One customer loved the look and fit so much they bought four different models to fit their favorite guns. There aren’t many consistent complaints about this product. The only ones found are that the trigger guard doesn’t completely cover the trigger—which some users actually prefer because it may make the gun easier to draw—and that the holster is expensive. Outlaw Holsters specializes in making over the waistband holsters that fit any gun in a variety of attractive styles. These holsters are affordable and made from the high-quality polymer called Kydex. This Green and Black USA Flag style is perfect for the firearm enthusiast that wants to show off their patriotism. But the style isn’t the only thing these holsters have going for them. The score mold holds its shape well over time and use, and they come in many different varieties to fit virtually any gun. The Level 1 retention means you have quick draw capabilities. Outlaw Holsters offer a one-year warranty for this OWB holster, so even if it were to get damaged, you can return it for a full refund or new one. 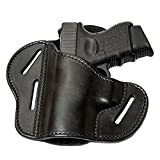 Customers reviewing this product agree that the open carry holster holds the gun well, is made from great material, and sits close to your hip for easy wearing. Those who don’t like the USA flag holster report that they don’t attach well to thicker belts (such as gun belts). One complained that the securing loops were confusing and caused it to be unwearable. The TEGE Glock Paddle Holster offers some unique features not seen with the other products on this list. It’s made from an unnamed polymer material that is designed to be maintenance free and adaptable to different environments. The paddles are adjustable and make fitting to any belt up to two inches thick a breeze. On top of that, the angle of wear can also be adapted to your preference making this a versatile holster. The Level 2 retention means that your gun is safe from grabbing by another person. The index finger triggers an easy-to-use button that releases your gun as you draw. 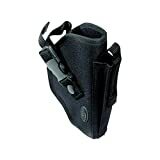 The company claims that this holster is in common use by authorities and is built to law enforcement standards. The dark color and matte finish give this holster a tactical feel that you may like. 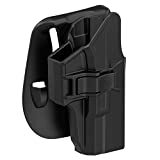 The most often praised quality of the KEGE holster by its users is the auto-lock retention feature. It secures your gun while giving almost no decline in draw speed. Customers complain that the paddle system is difficult to use. In order to adjust to your belt size, you need to use the screws on the holster. If you change belt thicknesses regularly, this may be inconvenient for you. 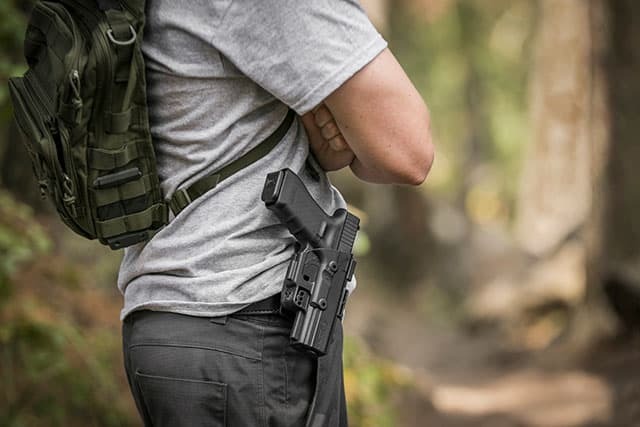 The Blackhawk Serpa Level 3 Auto Lock Duty Holster is built for law enforcement and individuals who need to draw fast and, at the same time, be protected from holster grabs. This may be one of the more expensive options on the list, but it’s also one of the most secure. The high-quality, tapered polymer offers a good level of concealment potential. The holster comes in both belt loop and paddle variety for customization in wearing ability. The biggest draw for the Blackhawk holster is the retention ability. An adjustable tension screw lets you choose how much friction you want in holding your gun. The Serpa firearm auto-lock system can be combined with a secondary top lock for extra protection from holster grabs. If you’re someone looking for a secure holster, you are likely going to love the retention system according to actual users. Even at Level 3, it doesn’t sacrifice much draw speed once you’re practiced at drawing properly. I didn’t find any consistent customer complaints about this holster. The only thing you may want to watch out for is the seams of the holster itself. Some customers thought it looked unfinished and worried about it’s durability. 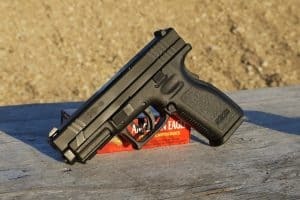 Which type of handguns is best for open carry? – Unless you have a special type you like to use, I recommend a full-size pistol in a 9mm or .45 caliber. These calibers do the job, and the full size allows for a large clip capacity and easier-to-use, more accurate shooting. How do police feel about open carry? – In this Quora thread, several police officers approve of the legality of the open carry but with a warning. They advise using a holster with at least one form of mechanical retention. Some authorities prefer open carry because handguns used for open carry tend to be easier to handle and safer to use. There is evidence showing that open carry can complicate situations where police feel threatened. Always be honest, calm, and respectful in these situations (as you should already be doing in any interaction with a police officer). Can a business have their own open carry policies? – Yes and no. Only a few states have opt-out policies that let them set up private gun-free zones in their business. The penalty for someone violating the company’s policy is a trespassing charge and/or losing your carry rights. Even in states without opt-out policies, a business can still refuse to serve you if you brought a gun into their store. My advice is to stay away from those stores if you want to carry and use your money elsewhere. If you’re fine with leaving your gun while you go in, then go for it. We hope you enjoyed our review of the best open carry holsters. Whatever reason you have for carrying—and you can pick any and all of the ones above—you’re taking a big step towards using your constitutional rights and becoming a beacon of security. But when you make the important decision to open carry, you had better do it right. Finding the best holster is a perfect place to start. Our top 5 holsters hit all of the top features to look for when buying. By reading about the holster’s draw speed, retention, durability, cost, and style you can compare the options and buy the best one for you. Carrying a handgun in the open can make a difference and give you a sense of protection; your holster should only add to that. If you enjoyed reading this article, you should check out The 5 Best Nylon Gun Belts on the Market.